I’ve been investigating computer science and computer programming this spring in a bunch of different ways, trying to make sense of it myself and figuring out where and how it makes sense for middle school students to get exposed to it. I do believe that it is an essential skill that we need to be exposing students to, especially if OES wants to remain a math and science powerhouse. I think computational thinking will be akin to the literacy movement of the 90s, during which schools pushed for reading and writing in ALL classes. I LOVE LOVE LOVE the format of Udacity. They give short 1-2 minutes videos about a concept, then do a 1-question quiz that checks your understanding. After several teaching videos, they have a couple problems to solve that build up to a final goal. The overall goal of CS101 is to build a web crawling search engine, which is awesome, so it gives you an engaging long-term goal. http://compscigail.blogspot.com/ – This is the only blog I’ve found so far but would love recommendations. 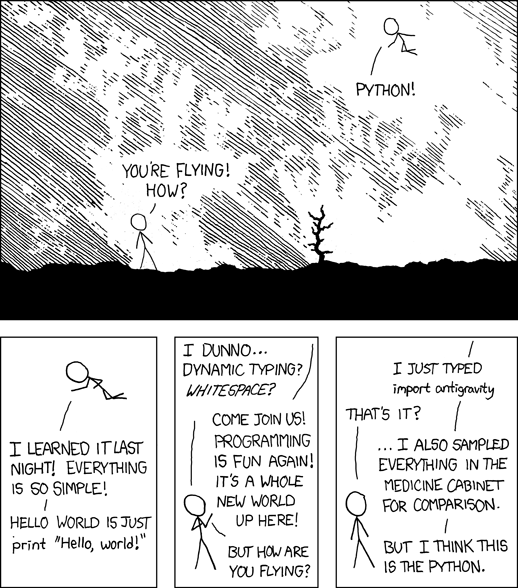 Python– This is what I’m learning in the Udacity class. Scratch – I’m taking a 1/2 day class at ISTE and hoping to get a better sense of this. This is what students learn in Lower School so it might be the most logical thing to continue in Middle School. NetLogo – I met John Jamison at school one day and he told me about NetLogo and the simluations he’s designed and are being used at the Bush School in Seattle in 6th grade humanities. I did a little researching on it and it looks super promising. I’m hoping next fall I can go up and visit Bush to see the project in action. Google Blockly – Just released – appears to be a visual programming interface like Scratch but web-based. This would be amazing if we could share projects through our Google Apps suite. What is really the difference between Computer Science and Computer Programming? Where does this content belong? Integrated into other classes or as it’s own CS class? While there is a natural fit between math and programming because of the logic and ability to manipulate numbers, there is also some talk that doing math problems is a turn off for girls, who engage better with projects that deal with social issues. Could this be a place for an after school club? Can I develop enough expertise to guide this? How will girls react to this content? Right now, I only hear boys talk about programming. Next Post Parents: Facebook may fade… are you ready for Tumblr and Twitter?